The Bio-Health sector is a priority economic sector for the Aquitaine–Basque Country–Navarre Euroregion, as shown in their Smart Specialization Strategies (S3). In Navarre´s S3, ‘Health’ is one of the 6 Thematic Priorities. Meanwhile, in the Basque Country, ‘Biosciences’ is considered to be one of the key enabling technologies with ‘Industry Science’ and ‘Aging and Health’ as market priorities and, finally, in the Aquitanian region the ‘Intelligent release of active ingredients for aging and health’ and the ‘integrated care processes and patient care techniques’ are between its thematic priorities. TIC SANTE CLUSTER Groups more than 80 companies that offers TIC solutions in the areas of hospital management, telemedicine and health data management. GIPSO (Groupement des industries Pharmaceutiques et de Santé du Sud-Ouest) Formed by more than 60 pharma, cosmetic, research and medical devices sub-sector´s companies. 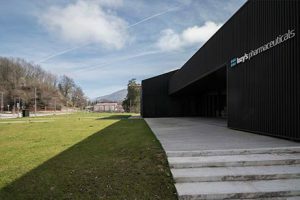 BASQUE BIOCLUSTER Around 30 Basque companies working on the applied biotechnology for human and animal health, cosmetic and diagnostics are part of it. The Foral region of Navarre is known for its high quality public and private healthcare services. At an assistance level, the University Clinic of Navarre (CUN) highlights for its capacity to attract numerous patients from other countries. Also, located just across the street from the CUN, you will find the Hospital Complex of Navarre, which constitutes the biggest public hospital of the region. Regarding to Higher Education, the University of Navarre (UNAV) offers the degrees of Medicine, Pharmacy, Nutrition, Nursing, Biology, Biochemistry, Chemistry and Biomedical Engineering, while Public University of Navarre (UPNA) offers Nursing and Physiotherapy. This researching ecosystem offers the companies placed in the Lekaroz Business Campus the opportunity to participate on high level R&D projects in collaboration with the previously mentioned centers and universities. A company called CINFA highlights over the rest in the Biopharmaceutical sector CINFA (Spain´s generic medicine sales leader) and it´s the reason why a smaller companies ecosystem has been created around it (IDIFARMA, 3P Biopharmaceuticals, Geiser Pharma…). The Society for the Development of Navarre (SODENA) participates in several Investment Funds specialized in the Bio-Health Sector, so, it could be part of new projects developed in Navarre as a co-investor. It´s not just a casualty that the first company placed in the Lekaroz Business Campus operates in this sector: LOZY´S PHARMACEUTICALS SL.